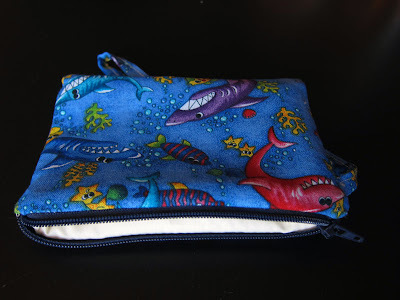 Tenía ganas de usar mi kit de forrar botones y que mejor ocasión que el cumple de Marta. 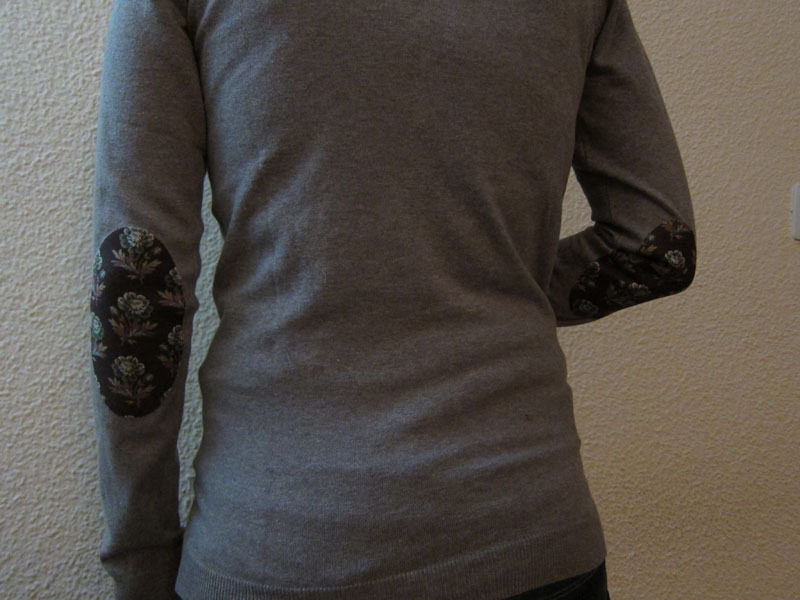 Así que se me ocurrió customizarle una chaqueta. Para ello compré una chaqueta sencilla, le quité los botones y los sustituí por unos forrados con tela. Para acabar de darle un toqué personal le añadí unas rodilleras de la misma tela. Tenía por casa unas láminas termo-adhesivas que convierten cualquier tela en una rodillera y todavía no las había estrenado. La verdad es que el resultado es impresionante. 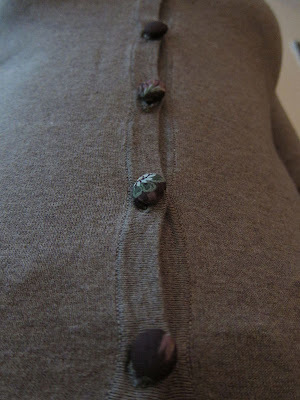 I was looking forward to use my kit to cover buttons and Marta's birthday was a perfect occasion. So I thought modify a jacket. For this, I bought a simple jacket, removed buttons and replaced them. 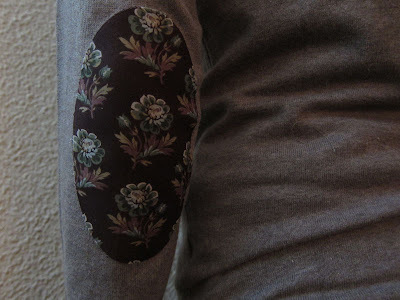 To add a personal touch I added kneepads made with the same fabric. I have a thermo-adhesive sheets that make any fabric in a kneepad and I had not yet used. The truth is that the result is impressive. Aquí os dejo algunas fotos de la primera Ganchillada que yo creo que fue un éxito. Y para que veáis que solo con cadena, punto bajo, punto alto y un poco de arte se pueden hacer cosas tan chulas como estas y sólo con unas horas!! 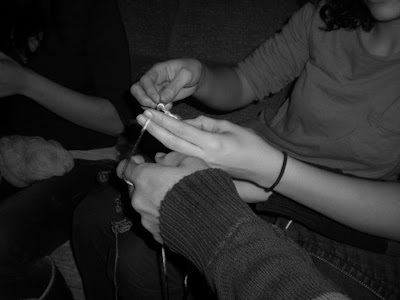 Here, I show you some pictures of the crochet meeting. I think that I was a sucess. With only know how to do chain, single crochet, double crochet and style, you can do thing like this. Después de hablar varias veces sobre ello finalmente me animo a organizar la primera Ganchillada. Estoy segura que no será la última. 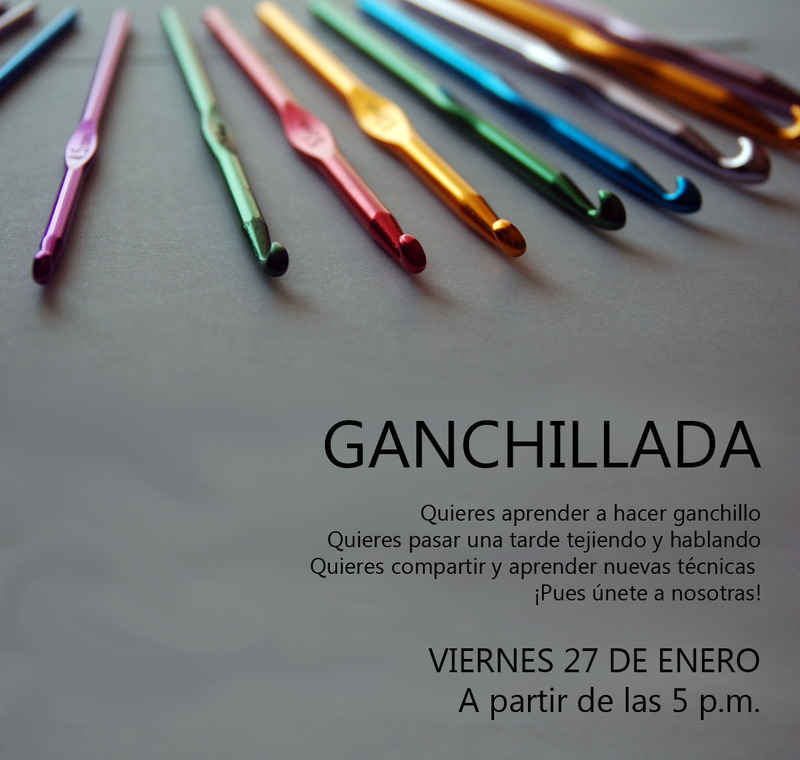 After talking a lot about it, finally I will organize at my place a crochet meeting. 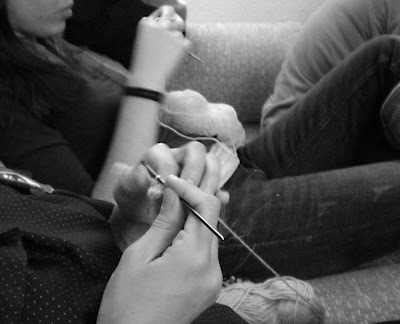 It should be a meeting to learn how to crochet or to knit, to learn new techniques and the most important to enjoy the afternoon talking and knitting. I am sure that it won't be the last. 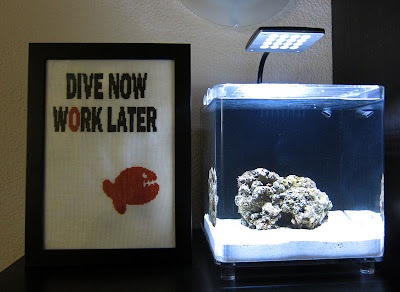 Desde que vi en el blog de DMC este cuadro de punto de cruz con la frase Keep Calm and Carry On (Mantén la calma y sigue adelante) tenía ganas de hacer uno. 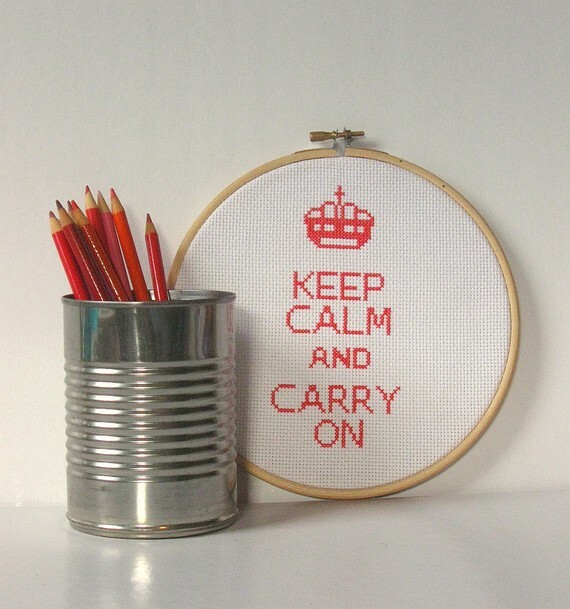 Since I saw in DMC blog this cross stitch charts with the phrase "Keep Calm and Carry On" I wanted to make one. Y se me ocurrió bordar uno de los lemas más conocidos del buceo "Dive Now, Work Later" (Bucea ahora, trabaja después) el cual ha popularizado IQ. El diseño es mio y no veais lo que me costó hacerlo... se me había olvidado ya. Se lo regalé a Piña y lo tiene puesto en su rinconcito de trabajo, y no para de decirme: ¿Cuándo nos vamos a bucear? 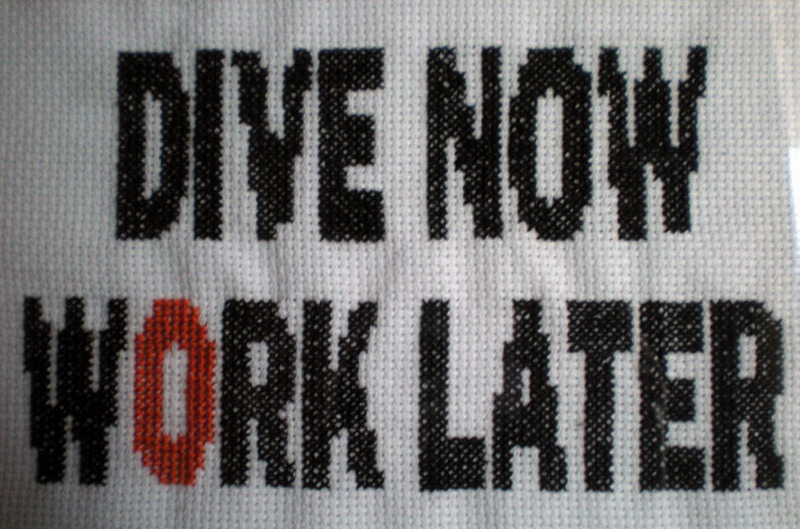 And I thought to stitch one with one of the most famous slogans of diving: "Dive now, work later". 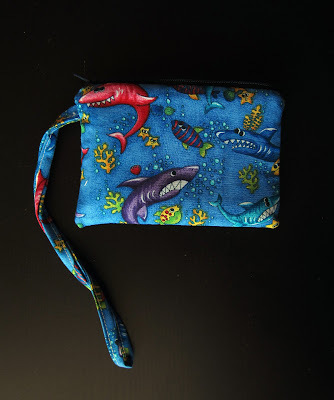 The design is mine and you can't imagine how much it cost me make it ... I had forgotten. I gave it to Piña and he has put it in his little corner of work, and every time he looks at it, he ask to me: When are we going to dive? 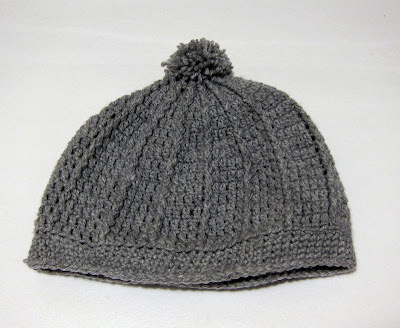 Después de ver lo sencillo y bien que quedan los gorros a ganchillo me animé a hacerle uno a Carmen y este es el resultado. 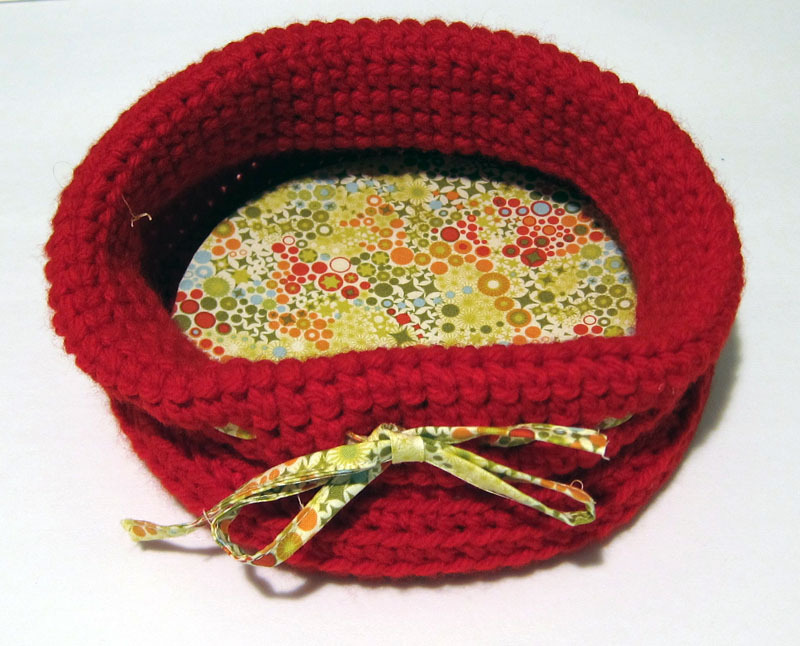 After see the good result of my first crochet bonnet, I decided to do one for Carmen. Here, you can see it. Este cesto se lo había prometido a Pilar hacía tiempo y por fin lo terminé. Esta hecho con una lana gorda para la cual utilicé un ganchillo de 8 mm. Para la base forre un círculo de cartón con tela e hice un lazo a juego. 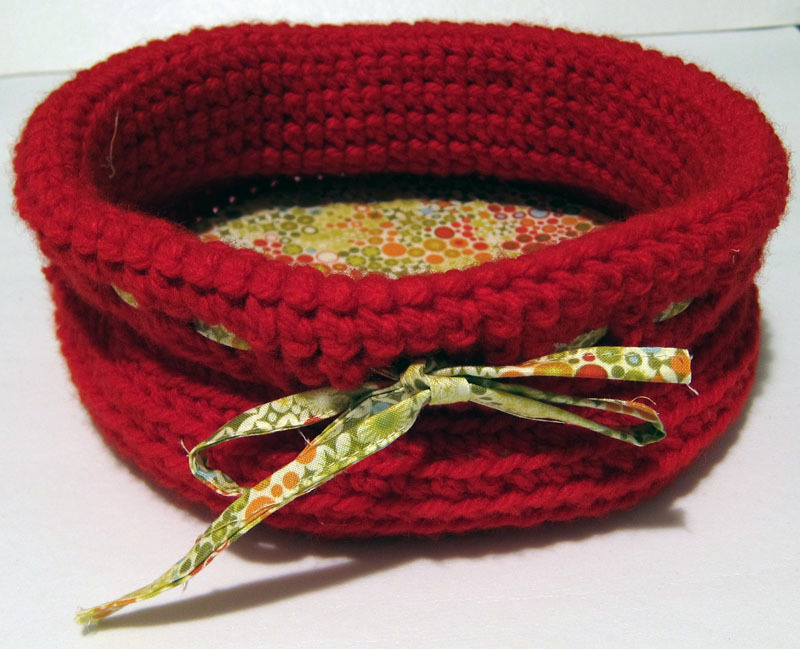 I promised Pilar to crochet a basket and finally I finished it. I used a 8 mm hook. I covered a circle of carton with fabric to the bottom and I made a ribbon with the same piece fabric to decorated it. En las próximas entradas os voy a mostrar algunos de los regalos navideños que he hecho. Hoy es el turno de las fundas para cámara de fotos digital. Marta y Piña tienen la misma cámara y para ellos he hecho estas dos funditas. Son blandas porque entre el forro y la tela he metido una especie de gomaespuma para proteger la cámara. In the next post I will show you some of the christmas presents I have done. Today is the turn of two digitals camera cases to Piña and Marta. 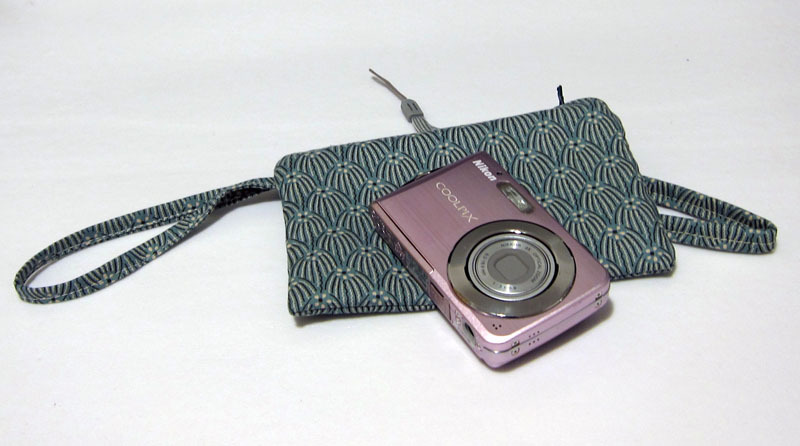 They are safe because between the lining and the fabric I put a kind of foam to protect the camera. Un año más Los Reyes Magos han llegado cargados de regalos y para mi por supuesto relacionados con manuelidades. Este es mi nuevo material. Another year, The Three Magic Kings arrived full of presents and for me, of course, related with "manuelidades". This is my new stuff. Unos papeles para hacer papiroflexio o para scrapbooking. De una papelería muy chuli yamada La Dominotería, la cual tendré que visitar próximamente. 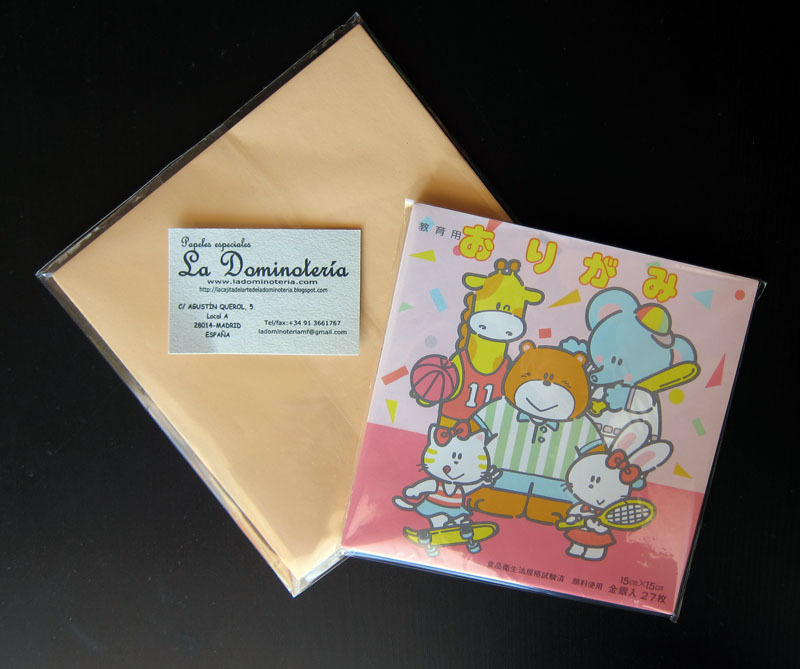 Papers for origami or scrapbooking from a stationery store call La Dominotería. I have to visit it. 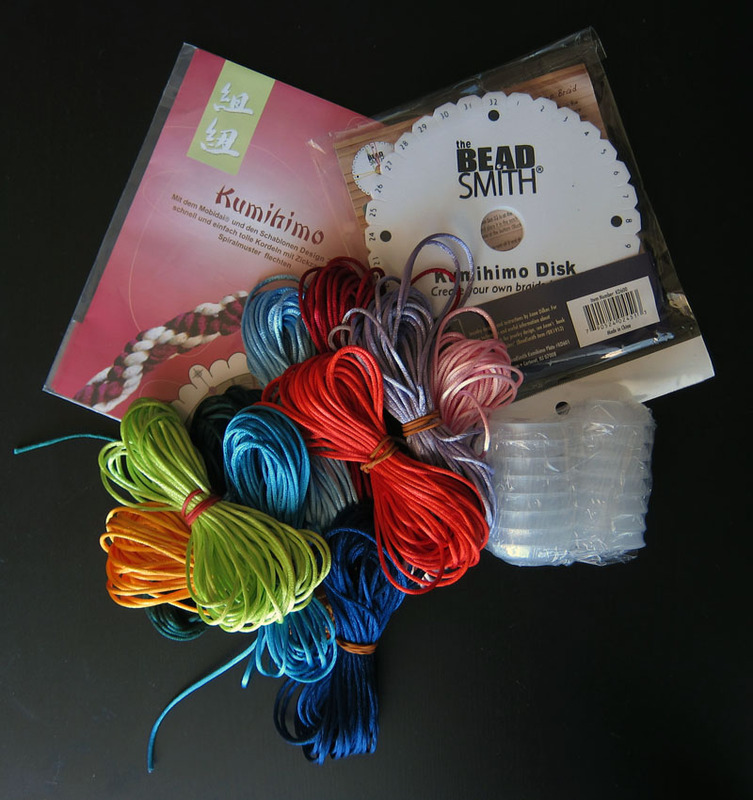 Un kit de Kumihimo ya os mostraré las cosas que se pueden hacer con él, aquí tenéis un ejemplo. Es algo que descubrí en Suiza y por supuesto Piña lo encontró ne internet para mi. 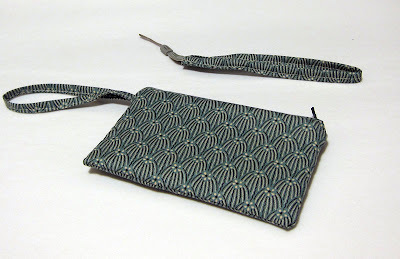 A Kumihimo kit, here you have an example. I discovered it on Switzerland and Piña found it on internet for me. Something new and strange. It is a plastic sheet, you draw and cut a piece and then introduce it on the oven. 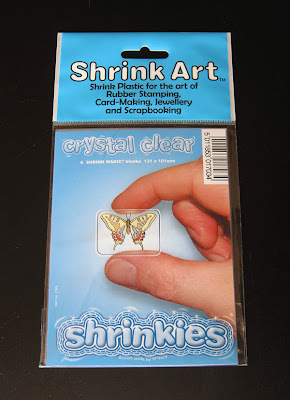 Then the plastic shrinks. We have try it to discover how it works. Unos pinceles para mis acuarelas. 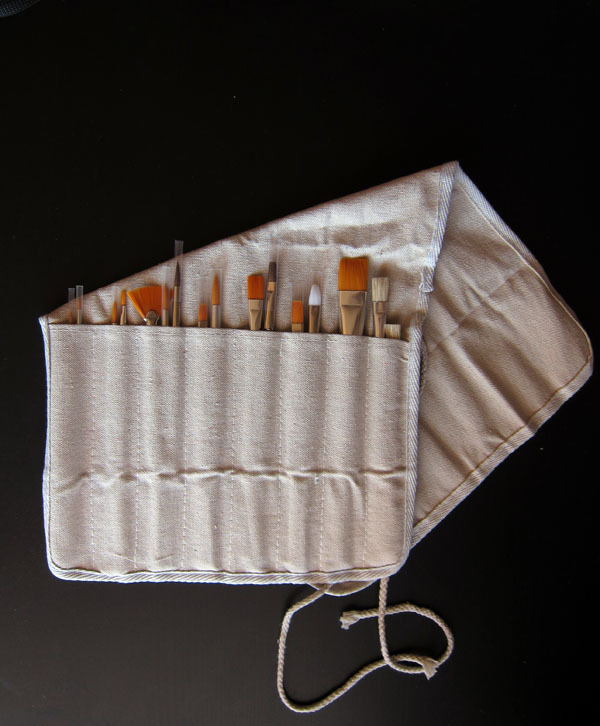 Brushes for my watercolor. Un kit para hacer forrar botones de tela. Tenía muchas ganas de tener uno ya que me parecen chulísmos y les veo un montón posibilidades. A kit to cover buttons with fabric. 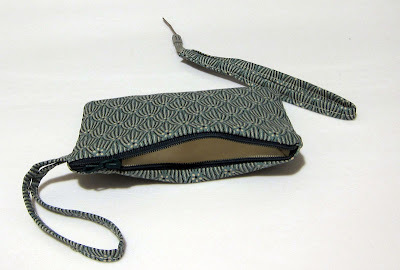 I wish one for a long time because I like so much how them look and I will see a lot of posibilities in my future crafts.